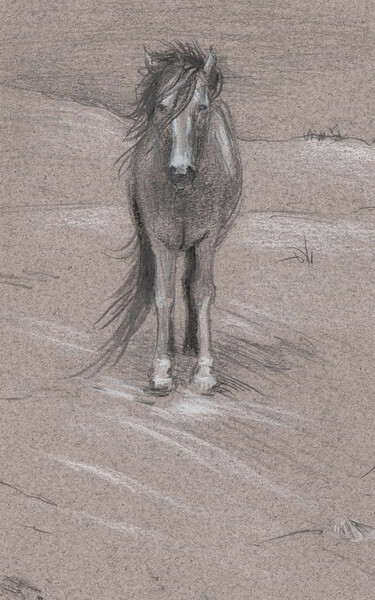 This sketch is done at Assateague Island near Chincoteague & Ocean City. It actually lies in the states of Virginia and Maryland. Camping on the beach there offers opportunity to come in close proximity to the wild ponies and deer that roam the island. They were all very calm and easy to stand and sketch. Though of course, you shouldn't attempt to pet, or get too close. If you're looking to vacation along the shore on the eastern U.S.A. you should consider stopping by. Beware, though, they humourously say their state bird there is the mosquito. Medium: Pencil on charcoal paper.